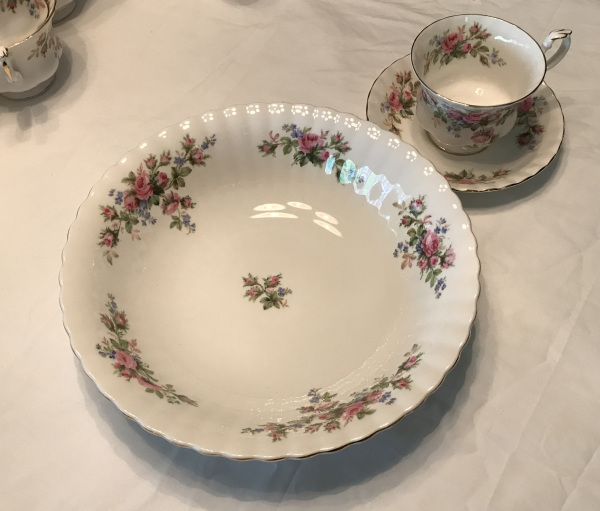 1956 Royal Albert bone china, Moss Rose Pattern. 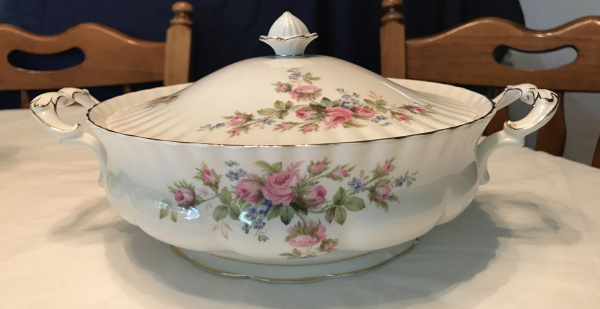 Covered Serving Dish. 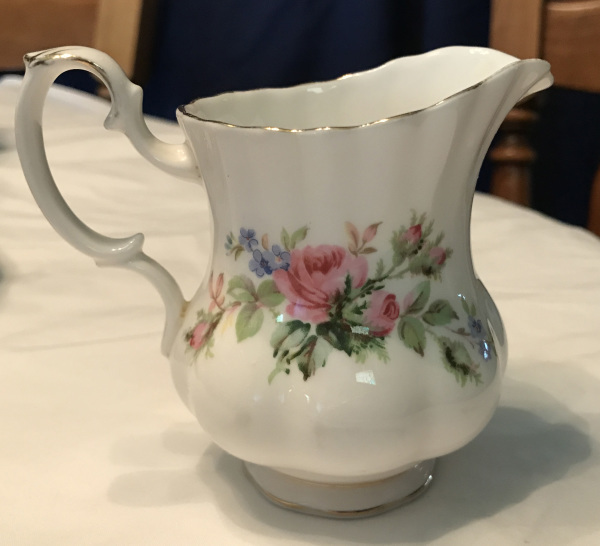 1956 Royal Albert bone china, Moss Rose Pattern. Gravy Boat and Saucer. 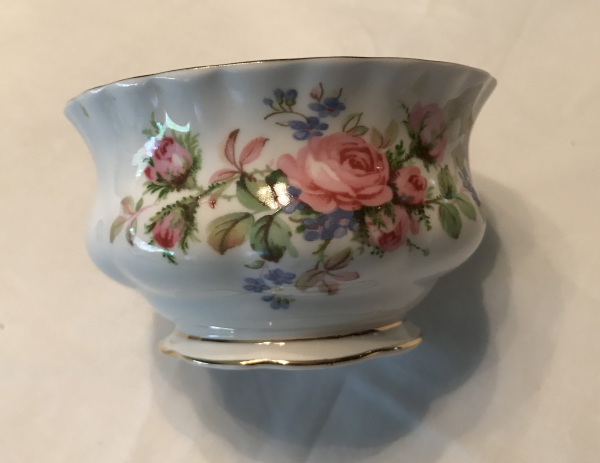 1956 Royal Albert bone china, Moss Rose Pattern. Serving Bowl. 1956 Royal Albert bone china, Moss Rose Pattern. Dinner Plates. 1956 Royal Albert bone china, Moss Rose Pattern. Tea Cups and Saucers. 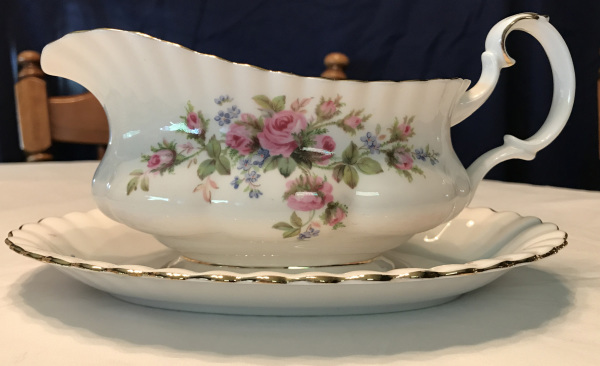 1956 Royal Albert bone china, Moss Rose Pattern. Tea Set Milk Pitcher. Royal Albert bone china, made in England, circa 1950-60. The pattern is "Moss Rose". I have only managed to find one date on the china, which is a copyright for 1956. These dishes belonged to my Aunt Edna who collected them - she lived in Canada. I remember her showing them to me when I was a child, and we enjoyed several lovely meals using them on special occasions over the years. They are in excellent condition. 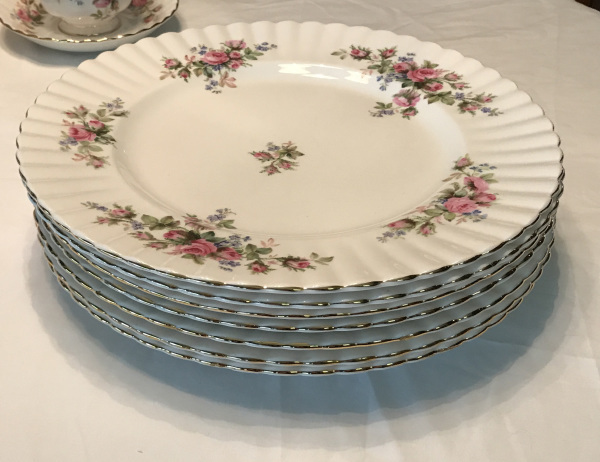 We want to go see our last remaining Aunt who lives in Canada, and so, ironically, I am selling these dishes as I would rather have a last visit with her than keep the china. We do take PayPal! But please email first. Payment can be made through PayPal, which will take debit and credit cards. the items are still available for purchase.